Wigger Draperies has grown for 47 years based on an excellent selection of merchandise and an excellent reputation for customer service. We Sell, Install and Repair Window Blinds, Window Shades and Curtains. Our experience with custom draperies, drapery fabrics and the furniture industry is what sets us apart from our competitors. Aside from being Edmonton's largest custom drapery manufacturer, Wigger Draperies is also Alberta's largest independent Hunter Douglas Blinds and Window Shades Distributor. We have also added budget priced blinds to our lineup. Our experience in the fabric and furniture industry is what sets us apart from our competitors. We pride ourselves on an excellent selection of merchandise, and an excellent reputation for customer service. Modern High End Imported Furniture from Europe: We are excited to highlight our new imported high end European Kler Fine Furniture Line. Please visit our office to place advance orders and to select your leather colors or view Kler's Custom Order Catalog. We provide on site installations in Edmonton, Sherwood Park, Spruce Grove, St Albert, etc. Please email, call, or come in for more information and to see how amazing we are! Wigger Express Ready Made Panels starting at $250 per panel! *Hunter Douglas Authorized Dealer* Hue Décor, serving Edmonton, Sherwood Park and Area, offers outstanding designer products, services and free expert advice. This stylish paint and window covering store houses a wide selection of premium home design brands. Everything from quality paints to fashionable window coverings, designer wallpaper, and much more including: • Benjamin Moore Paints • Hunter Douglas Window Coverings • Drapery • Wallpaper and Wallcoverings • Home decor, and more We are a residential and commercial, blind and custom drapery company, using only premium quality products from leading industry suppliers, such as Hunter Douglas. As a Hunter Douglas Showcase Priority Dealer, our trained staff can help you select the right products for your home or office. Our professional installers and seamstresses, all experts in their fields, and each with over 15 years experience, will provide quality service for your order. Visit us for all of your paint, window covering, wallcovering, and home decor needs. *Hunter Douglas Authorized Dealer* Linh’s Window Fashions specializes in custom Blinds, Shutters, Shades and Drapery for your home and business. We also offer repair service and Ultrasonic cleaning. We provide a more intimate, personal experience for our clients. You are sure to have our devoted attention all to yourself until your project and vision is complete. Whether you want to cover one window or you are undertaking a large commercial project, we have the professional expertise and the resources to accommodate you. We pride ourselves on our ability to work within your budget to deliver an end result that exceeds expectations. In addition to maintaining the highest quality and service, we are pleased to guarantee the lowest price. Since 1995, Linh’s Window Fashions has believed that satisfying the customer is simply the minimum requirement of staying in business. We do not attempt to simply “satisfy” our customers. We strive to give our customers more value than they expect, whether measured by price, performance, quality, features, or the service rendered. Our goal is at the very foundation of our beliefs, which guide us in everything we do. We know we are successful when we inspire our customers to go out and refer others to us. We are a HunterDouglas Showcase store in Edmonton. 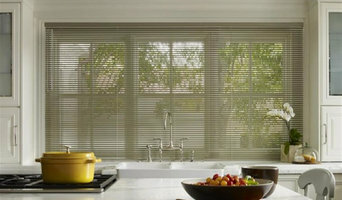 We carry the full line of HunterDouglas Blinds, Shades and Shutters. You see a window. We see all the possibilities. At Budget Blinds, service is always in style™. Our professional Style Consultants offer free in-home consultations and work directly with you to find the best solutions possible for any window covering or interior design dilemma you may have. Call today to schedule your FREE In-Home Consultation! Or swing by our Design Centre located at 2844 Calgary Trail NW Edmonton, AB! We also do appointments on Saturdays! Devine Blinds offers a great selection of blinds, shades, custom window blinds, window coverings and window shades made to your window's dimensions to help turn your house into a home. We offer the most comprehensive advice to help you make the best decisions to match your lifestyle. Shopping for your favorite product is easy. We carry custom wood blinds, faux wood blinds, cellular/honeycomb shades, pleated shades, roller shades, fabric roman shades, woven wood blinds and a great line of drapery. We are proud to be a Graber Dealer. KNS Window Fashions opened in 1983; since then we have been innovators in the industry and have earned a solid reputation of providing local customers professional workmanship, quality products and prices to suit every budget. Our mission at KNS Window Fashions is to help you choose window blinds, shades and custom window coverings that reflect your personal style and enhance the beauty of your home or office. Our showroom is chalk full of the latest and greatest in all styles of blinds and shades, drapery fabrics and colors, and decorator hardware. If you are looking for window covering ideas, custom draperies, bedspreads, valances and beautiful hardware to complete your room’s décor and ambiance, make sure you stop by our showroom to view, touch and compare many fine products – all in one convenient location. We are proud suppliers of Hunter Douglas, Graber, Elite, Maxmaar and other quality name brand blinds and shades as well as suppliers of fine fabrics from distributors such as Kravet, Robert Allen, Maxwell, Joanne Fabrics and many more. We offer one of the largest selections of decorative drapery hardware in Northern Alberta. To ensure quality and quick delivery, we make all our custom draperies, valances and treatments on site in our own workroom. Your satisfaction is guaranteed. Custom curtains and cushions designed by you, online. Build your perfect pair of drapes in three easy steps, starting with fabric selection. 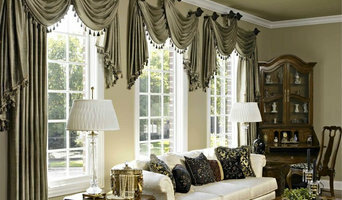 We offer competitive custom designer quality drapes and cushions, without the custom prices. 100% Canadian. Start your Dress Your Drapes buying experience by choosing one of our five different styles of drapes. We offer pinch pleat, signature pleat, beauty pleat, tube pleat and grommet panel. Then browse and choose from over 350 different patterns and textures of fabrics to match your space at home. Finish your order by entering your window dimensions and editing your personal preferences so we can create your custom drapes exactly how you want them. 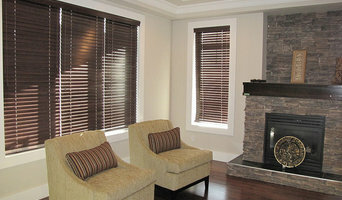 MITS Blinds (Made in the Shade Blinds Edmonton) offers the best window covering products in the industry with exceptional service and affordable prices. Our advantage is that we bring the showroom to you with our shop-at-home convenience. We proudly offer Hunter Douglas, Graber, Shade-O-Matic, and Horizons Window Coverings. Expressions specializes in putting together design concepts using various elements like, furniture, accessories, window fashions, wall coverings, tile and more. This allows our cutomers to acheive their ideal mood or style in a very custom tailored way. Expressions is also a Hunter Douglas Showcase dealer and Certified Motorization Specialist. We carry the entire Hunter Douglas product line, including Allustra, and are trained to design, sell and install hardwired motorized window covering systems. Made in the Shade Blinds & More offers the best window covering products in the industry with exceptional service and affordable prices. Our advantage is that we bring the showroom to you with our shop-at-home convenience. At Made in the Shade, our personalized service includes a complimentary consultation, complete with free measuring and a free estimate. This service allows you to see various window coverings in your own environment, enabling you to see how light, room colors and furnishings affect your options and choices. You will find quality, name-brand window coverings at GUARANTEED LOW PRICES, and every purchase is backed with a manufacturer’s limited lifetime warranty. Our goal is to have completely satisfied customers every time. So, let us provide you with the most pleasant window covering shopping experience ever! Founded in 1992 by entrepreneurs with a unique "customer convenience" concept. Blind Magic is now the largest and fastest growing window covering care company in Edmonton. Blind Magic has all the window covering services you will ever need. Sales / Decorating With the assistance of our interior decorators, you will be able to select the window coverings that perfectly match every window application in your home. Installation Once your selection has been made, Our experienced measuring and installation crew will ensure that your blinds are professionally installed. Ultrasonic Cleaning As the seasons pass you will want to protect your investment by allowing Blind Magic to ultrasonically clean, lubricate and maintain your blinds. Repairs On the odd occasion that a blind does not function as you would like it to, Blind Magic authorized Hunter douglas repair division will investigate the problem and quickly repair back to as new Secret to Our Success At Blind Magic, our mission is to be the recognized leader in our industry by providing professional service through continued complete satisfaction, quality, and integrity. 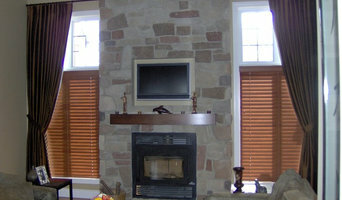 Accent Window Care provides window covering expertise to customers based in Edmonton and surrounding areas. Our main focus is on sales of new residential or commercial manual and motorized blinds, shades and drapery. We also clean and repair a variety of window coverings. Our highly trained staff will provide you with timely and reliable service. We strive to deliver the best window covering solutions for your needs where the accent is on value. It is also worth mentioning that our team consists of certified MechoShade specialists. We have won numerous awards over the years for exceptional service in both residential and commercial categories. Accent Window Care Inc is a member of the Edmonton Construction Association and BOMA successfully providing service to large construction companies.